OSAKA- After decades of sinking sales, naval ship plastic model kits are proving a hit once again, buoyed by a popular free online card game featuring anthropomorphic World War II maritime vessels. 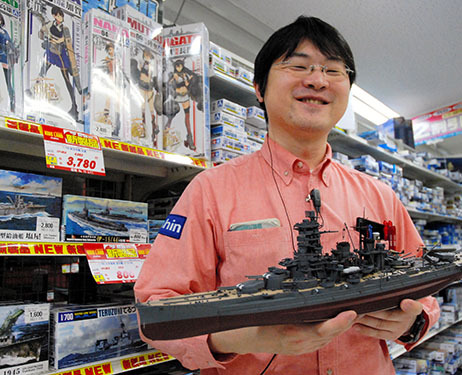 In 2013, the Super Kids Land hobby shop chain’s main store in Osaka’s Naniwa Ward saw about a threefold increase in sales of plastic model kits of warships from the previous year. Popular items include plastic models of the destroyer Shimakaze, the heavy torpedo cruiser Kitakami and other naval vessels deployed during the Pacific War, whose names are not as familiar as the Yamato, the iconic battleship of the old Imperial Japanese Navy. According to the store, the main customers are in their teens, 20s and 30s. “Products that barely sold before are flying off the shelves in dozens each month. We can’t keep up with orders,” a salesperson said. The peak of model ships came in the 1970s, according to Shizuoka-based plastic model maker Aoshima Bunka Kyozai Co. But a company official said in recent years, the sales had been less than one-10th of what it was during the peak period. The company attributed the decline to the success of anime-related products such as plastic models from the “Gundam” robot anime franchise and an increase in choices for people to spend their spare time. Over the past year or so, however, the company has seen a nearly fivefold increase in its model ship sales. “Most ship model enthusiasts used to be in their 40s or older, but there has been a rapid increase in the number of younger customers,” said an employee of Tamiya Inc., another Shizuoka-based manufacturer. Industry sources have attributed the model ship comeback to “Kantai Collection,” a naval combat simulation online card game developed by Tokyo-based Kadokawa Games Ltd. “KanColle,” as it is often called, was released in April 2013 and soon gained a loyal following. Currently there are about 1.9 million registered players. In “KanColle,” players serve as an “admiral” and take command of a fleet to battle mysterious enemies. They collect various resources such as fuel and steel, customize their ships and build more powerful warships. For example, the Kitakami can considerably increase its abilities with repeated alterations. It is inspired by the historical fact that the heavy torpedo cruiser was remodeled from a cruiser. The game’s most significant characteristic is the anthropomorphized warships called “kanmusu” (fleet girls). The cute girlish characters wear cannons, flight decks and other naval accessories as their attire. Yutaro Ichikawa, 19, a college student in Higashi-Osaka, Osaka Prefecture, became fascinated by “KanColle” last summer after a friend recommended the online game. “I started it because the characters looked cute,” he said. But he developed an interest in historical warships and bought models of the aircraft carrier Shokaku and the battleship Kongo. “I had an impression that it was a hobby for old people, but I became interested in history,” Ichikawa said. Kensuke Tanaka, 45, the developer and operation director of “KanColle,” has always been a fan of model warships from a young age. “I started developing the game because I wanted to share historical facts about naval vessels that tragically sank and other warships,” Tanaka said.Because ships are sometimes referred to as female as in “sister ship,” Tanaka came up with the idea of portraying the warships as girls. “If people take an interest in (warships) with ‘KanColle,’ I hope they will read books and other publications to learn about warships and contemplate their history,” Tanaka said.